Well, it’s been a month since our Portland trip, so I guess it’s about time I got around to writing this post. As I mentioned in this post, we spent a good bit of time on bikes while we were there, averaging about ten miles a day, all around the town. 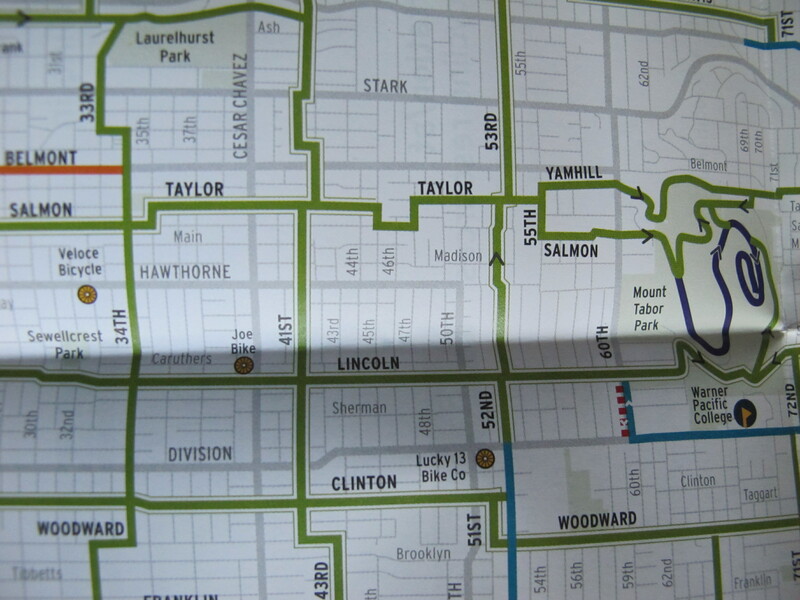 The bike map was useful for telling us where to ride, and, just as importantly, where NOT to ride (i.e., we planned our routes to avoid streets with bike lanes).
. . . residential streets with low volumes of auto traffic and low speeds where bicycle and pedestrians are given priority. So, how do they achieve “low volumes of auto traffic” and give priority to people on bicycles? These routes are marked with well-placed sharrows (above) and low, broad speed bumps (below — also, mini horses 🙂 ). Another design feature is intentionally minimizing stop signs, which are a bigger bother to pedal-powered travelers than to motorists. Instead of four way stops at every. single. intersection (ahem, StL, I’m looking at you), most intersections along these routes used 2-way stops at the cross streets, allowing traffic on the bike boulevards to flow smoothly. Some intersections used a “mini traffic circle” (for lack of a more official term), pictured above, in conjunction with the 2-way stops, for traffic calming. So, the bike boulevards in general get a thumbs up. Throughout our stay, we sought out these routes, combining them as needed with “regular” streets (i.e., streets with no bike infrastructure). 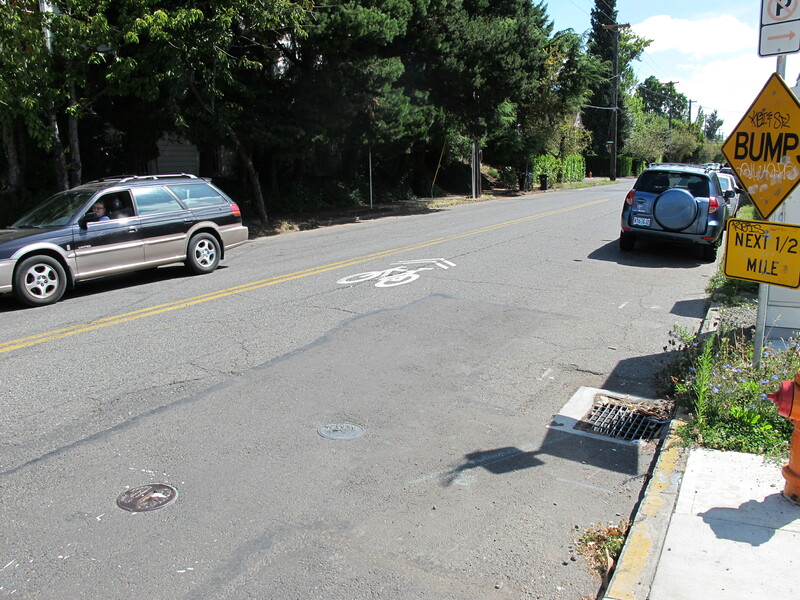 The bike boulevards did have some design quirks. If you look at the map pictured at the top of this post, you’ll see that you often have to do some little “jogs” to stay with the green routes. Sometimes these were marked well, sometimes not. 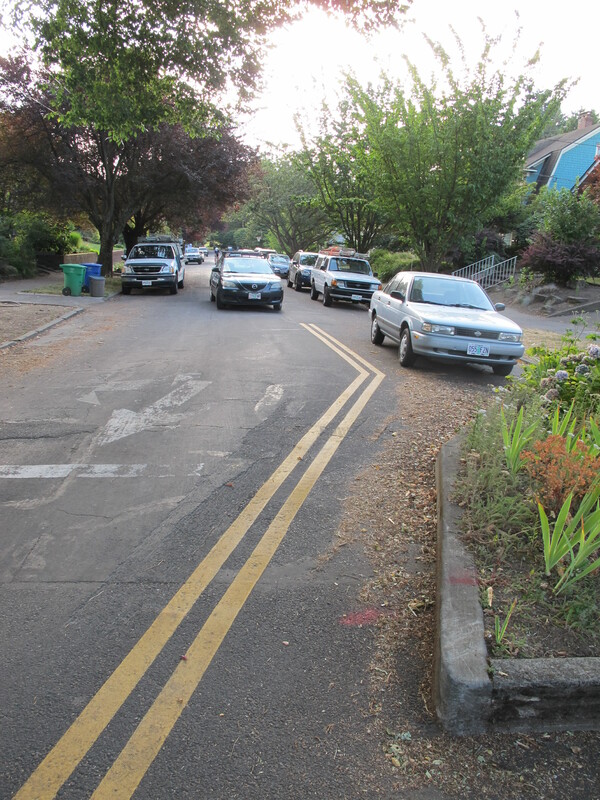 If you lived in Portland and rode these routes every day, it wouldn’t be a big deal. As visitors, it was a bit confusing and frustrating at times. I understand this is another technique for reducing/discouraging non-local motor vehicle traffic, but in addition to being dangerous in this location, it potentially encourages wrong-way riding on OTHER streets. If they really want to do this, I would suggest at least eliminating parking on the right side of the street, to create more space for movement, as well as adding some sharrows to make people more alert to the anomaly. In some places where this occurred, the offense wasn’t quite as egregious, as the street immediately reverted to two-way traffic, and, you know, actually had enough space to operate a bicycle. 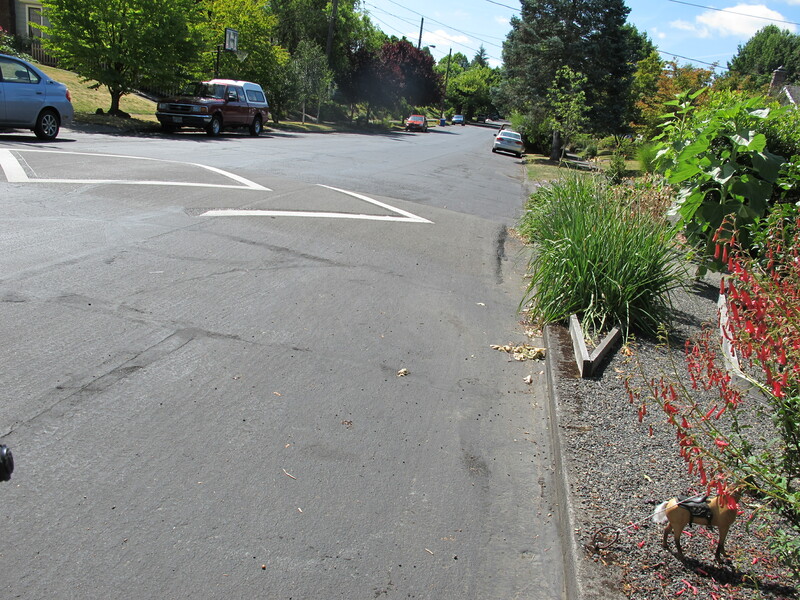 Median to prevent thru motor vehicle traffic. These medians, with cut-outs for bicycle pass-throughs, were usually found where the bike boulevards intersected with a larger street. Again, this discourages motorists from using these routes for long distances, as they are only thru-routes if you’re on a bike. This is perhaps a decent idea, but, as implemented, the cut-outs are clearly designed for edge-riding cyclists. This design becomes particularly problematic if the cyclist wishes to make a left turn at one of these intersections, as you first have to cut right, then back left to make the turn. Not impossible, but it does require extra communication to make your intentions clear to both motorists and fellow cyclists. For the most part, we used the bike route map to successfully avoid “the ugly.” We did find ourselves on a couple of short stretches of roads with bike lanes. These were invariably door zone bike lanes, that sandwiched you nicely between parked cars to the right and moving motor vehicles on the left. No thanks! I should note that, on this trip, we were always pulling a trailer (or riding a box bike like the Bullitt) which should be a valid excuse for not ever using a bike lane — these things are just too wide for bike lanes, period! 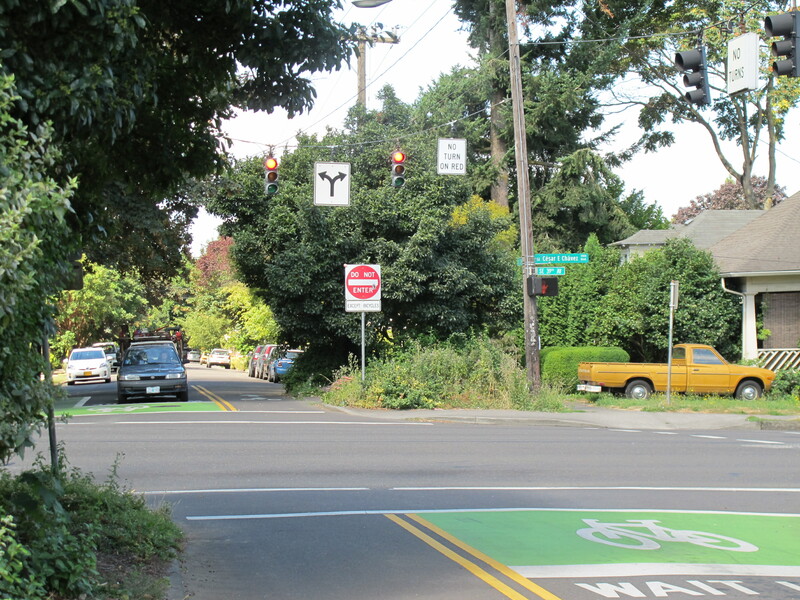 I don’t have any photos of Portland’s bike lanes, since we avoided them so successfully, but for a deeper look, check out Andy’s excellent series on the topic of Portland bike lanes at Carbon Trace: Part 1, Part 2 , Part 3. Where to begin? On this street, what had been a two-direction road divided into two, separate one way chunks. 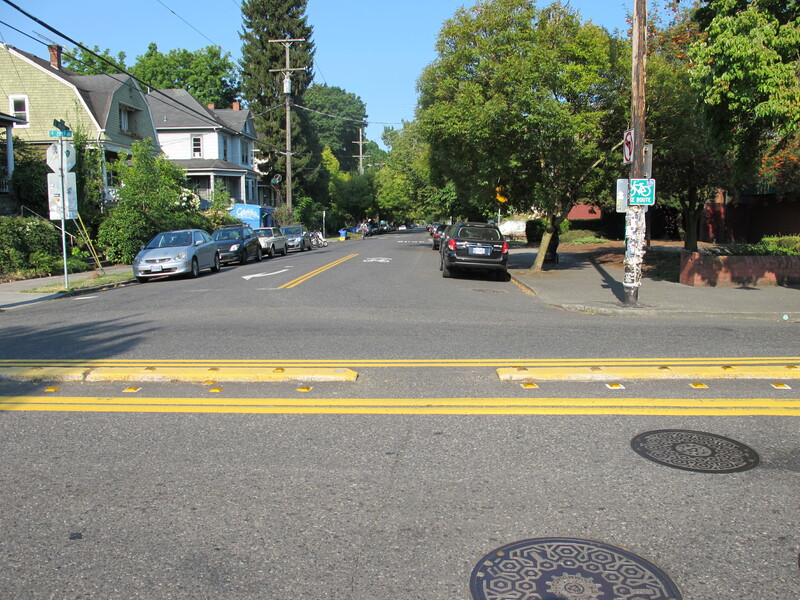 But that didn’t stop the Portland traffic engineers from installing a bi-directional bike lane. What you see above, from left to right: a sidewalk, a north-bound bike lane, an against-traffic [south-bound] bike lane a buffer zone (the lane with the chevrons in it — UPDATE: I was incorrect in my original identification of this space; see comments for details), two north-bound travel lanes, and another sidewalk. 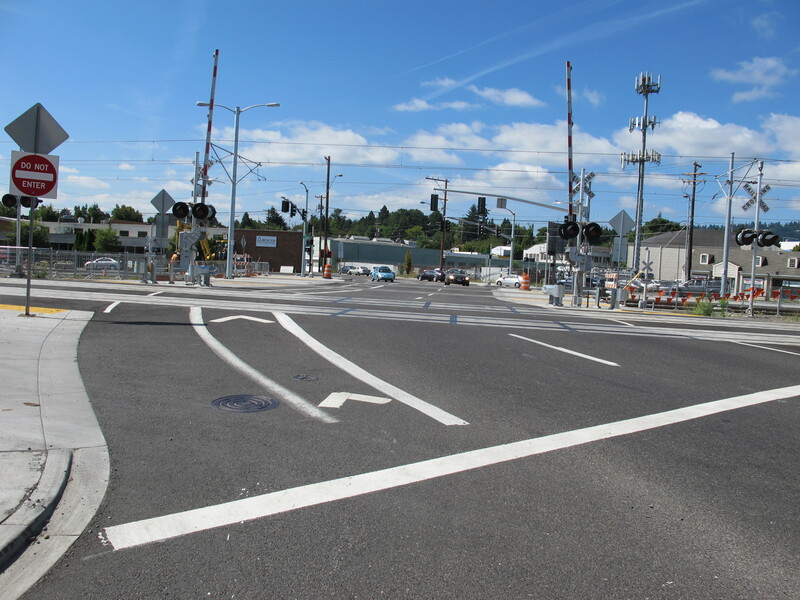 The presence of multiple rail tracks just south of this intersection adds to the general confusion. There is a “Do Not Enter” sign, but we were confused as to whom that sign was addressed. On our very first encounter with this intersection, Matthew accidentally ended up in one of the [regular] travel lanes, going the wrong direction. I was still waiting at the stop sign, trying to figure out exactly what was going on and how best to respond, and I watched in horror as I realized his mistake — he was headed right toward a car in the same lane. Fortunately, he was able to divert onto the sidewalk on the far side. In the end, much as I avoid sidewalk riding, the sidewalk is also what I chose for this small stretch. In the end, even “good” bike infrastructure, such as the bike boulevards, is no replacement for comprehensive bicycling education. 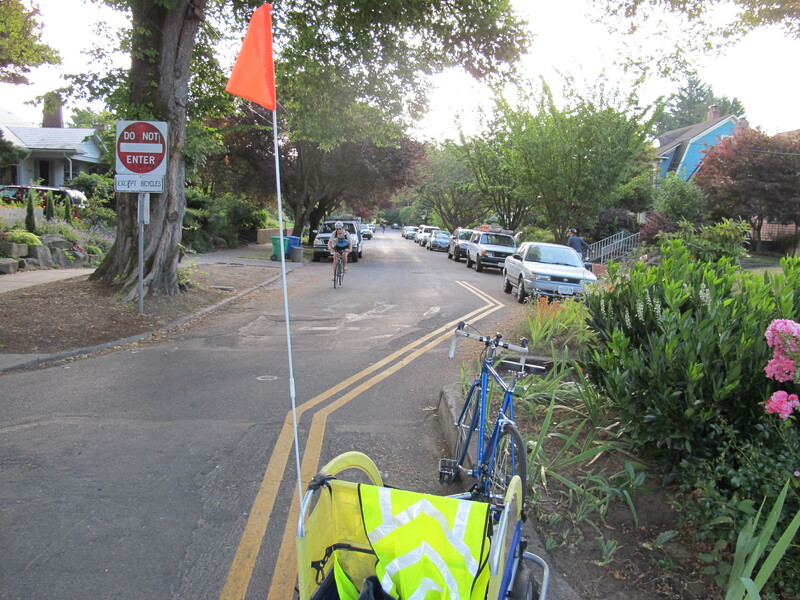 The majority of the bicyclists I saw riding on the bike boulevards in Portland were operating in either the door zone or the startle zone, despite the presence of properly placed sharrows directing them elsewhere. At one point, while traveling along a bike boulevard, Matthew was almost the victim of a drive-out collision. It was a two-way stop — so the motorist had a stop sign and we did not. The motorist stopped at the stop sign, but was already on his way, with his front bumper out beyond the curb, when he saw Matthew and stopped again. If Matthew had been practicing edge-behavior, rather than driver behavior, he quite possibly would have been hit (being away from the edge makes you more visible). In other kinds of transportation facilities, we do not have the most inexperienced users decide out of fear which are the best designs. *If you’re headed to Portland, you can order a bike map ahead of time here, or just visit most any bicycle shop once you arrive. **Not sure of the full details, but a local (StL) traffic engineer told me those speed bumps (and/or the mini traffic circles, I don’t remember which) don’t work so well in places where snow plows are needed. This entry was posted in Biking and tagged bicycle education, engineering, travel. Bookmark the permalink. I grew up in Portland, and this is a good analysis of our current state of affairs with infrastructure. 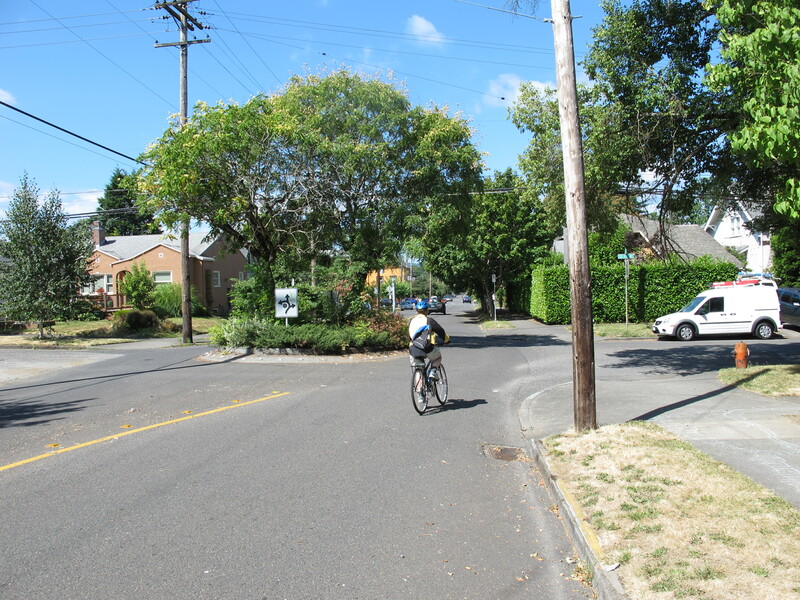 Most regular cyclists in Portland use the neighborhood greenways and avoid the bike lanes, as you did. I disagree with your interpretation of the situation in that last picture though. It’s obviously poorly marked, as the chevrons should connect all the way to the edge of the lines. That space with the chevrons is a buffer zone between the bike lane and the primary lanes. It’s a lot more clear from this view. Looking to the right and left, you can see there’s a northbound bike lane that continues across the intersection and is protected by that buffered area. On the other side, you can see that there is a southbound bike lane next to southbound traffic. That intersection area is still under construction due to the new MAX line going in, so the striping may not be complete. It definitely needs some improvements to be more clear, but it’s not as crazy as you initially thought. Thanks for that clarification, Nathan. Now that you mention it, it makes much more sense for that to be the “buffer” space than an against-traffic bike lane. I’m not accustomed to seeing buffered bike lanes, so that possibility didn’t even occur to me. As you point out, the construction made that whole area particularly confusing. 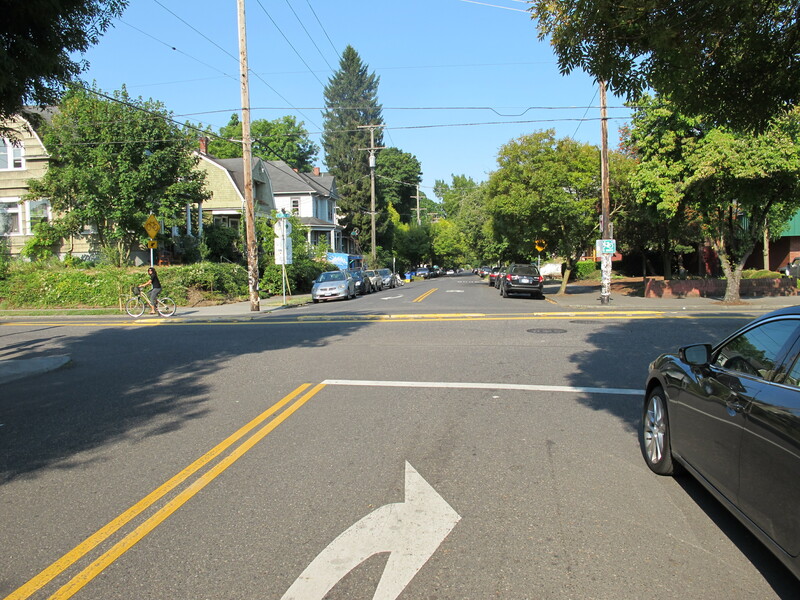 It wasn’t at all clear how we were to get to Milwaukie Ave (i.e., the southbound road that parallels the northbound road pictured in the post). Looking on the map now, it appears there will be a cut-through for cyclists and peds, but it wasn’t open when we were there. One more thought: it’s common enough to see wrong-way cyclists in standard bike lanes. Whether through ignorance (i.e., confusion like ours) or intentional mis-use, I can see this being an issue with this design. Very interesting! Denver often looks to Portland as a model for bike infrastructure, but as you point out, they’re not exactly um… perfect. I’m excited about the fact that we’ll be getting some bike boulevards, but all of the new bike lanes are just scary – I avoid them like the plague. Really appreciate the work you are doing with the care and nurture of this blog.